LG Electronics' G4 is a high-end smartphone with a removable battery and a microSD card slot, but its design falls short when compared with other expensive devices. Last year, LG had a hit with the G3, thanks to its high-resolution screen and aggressive pricing, but the company may have trouble replicating that success with the G4, announced on Tuesday. The phone has a 5.5-inch, 1440 by 2560 pixel screen and a Qualcomm Snapdragon 808 processor, which isn't as powerful as the Snapdragon 810. LG thinks the Snapdragon 808 offers a better balance between performance and power efficiency. 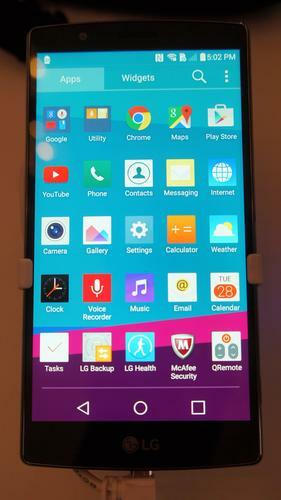 The G4 feels fast enough, so the company might be on to something, and the screen looks impressive. However, a high-end smartphone today needs good specs and a premium design so consumers feel they have gotten their money's worth. The G4's design is hit-and-miss. Its leather back looks good, especially in black, brown and red, but the material on the side disappoints when compared with competing products. Still, the leather gives the phone a pleasant texture, and makes it less slippery than smartphones with glass or metal backs. For users who don't want a leather smartphone, an alternative model uses a mixture of ceramics and polycarbonate, but it unfortunately looks cheap. Another disappointment: the G4 is bigger and heavier than the G3. What LG does get right is the big, replaceable 3,000mAh battery, and the option to add storage using a microSD card slot. However, it wouldn't have hurt to offer a model with 64GB of integrated storage, along with the existing 32GB version. LG is also giving consumers more choice when using the 16-megapixel main camera, such as the option to save photos in a RAW format, in addition to JPEG. A new manual mode lets users control the focus, shutter speed, ISO and white balance. It remains to be seen whether these features will attract a significant number of buyers, but it's a step in the right direction. The smartphone will start its global rollout on Wednesday in Korea and is expected to go on sale in Europe and the U.S. at the end of May. In the U.K., the G4 will cost £500 (US$765) or £525 including tax and without a contract. Overall, the G4 is a solid, incremental upgrade over the G3, but, like other expensive Android smartphones, it will face intense competition from new mid-range models, which have improved a lot, and from last year's discounted high-end smartphones, such as LG's own G3. As a result, buyers weighing their options may balk at paying more than $600 for a phone or at signing an expensive contract, especially if a great camera isn't a must.